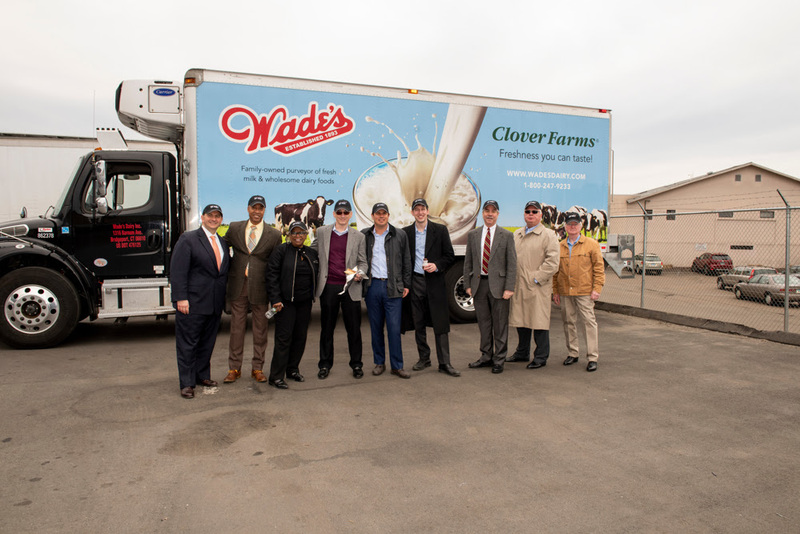 We’re thrilled to share that Wade’s Dairy had a special event at the dairy on this past Monday, March 25th. Our State Senator Marilyn Moore brought David Lehman to the dairy to tour our facility. There he learned about how we have hired an additional forty additional employees over the past 30 months since we received financial assistance from the Connecticut Department of Economic and Community Development which David Lehman is now the Commissioner of. The DECD loan that we received allowed us to build a new warehouse facility that spurred our dramatic increase in sales revenue and hiring. We’re honored to be involved with such a great local government that allows us to service the wonderful community around us! 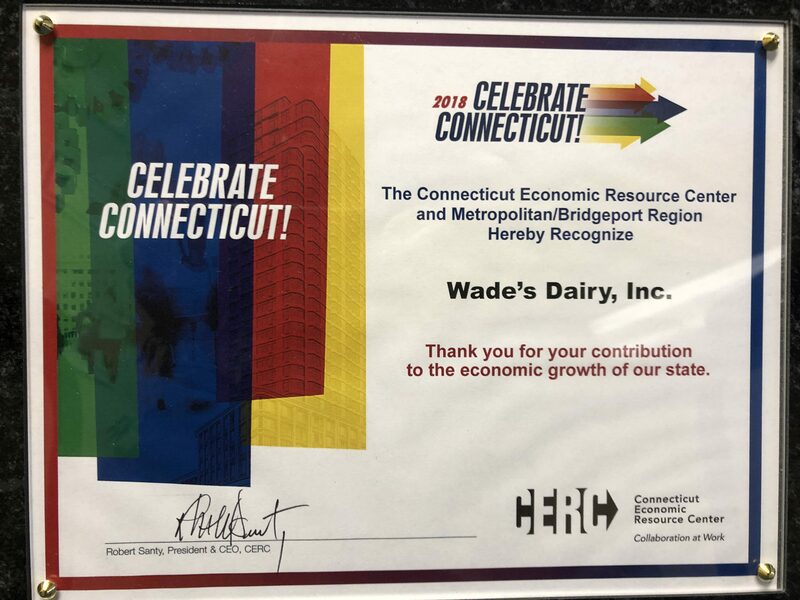 We’re thrilled to announce that Wade’s Dairy have been recognized by The Connecticut Economic Resource Center and Metropolitan/Bridgeport Region. Each year since 2010, CERC has hosted an annual event called Celebrate CT. This event honors economic successes and features recent accomplishments from across Connecticut’s different rgions. Awards are given out in a variety of ways for a variery of noble causes, such as, awards recognizing people and initiatives, to establishing networking opportunities to connect others who have a similar goal of making Connecticut a more competitive business environment. This event is an aggregate of both the public and private sector professionals; with over 200 attendees! 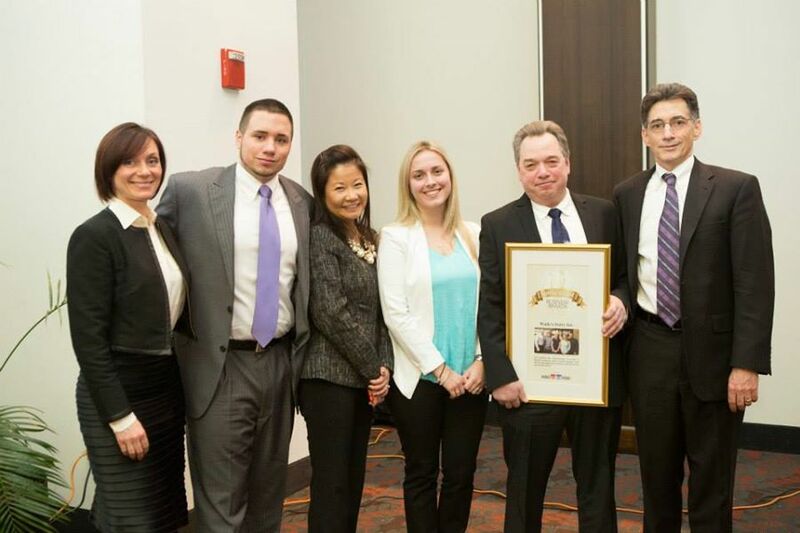 We are truly honored and humbled to be receive such honors and have the great state of Connecticut and our wonderful team to thank. Our award is seen below and a video from the event as well! 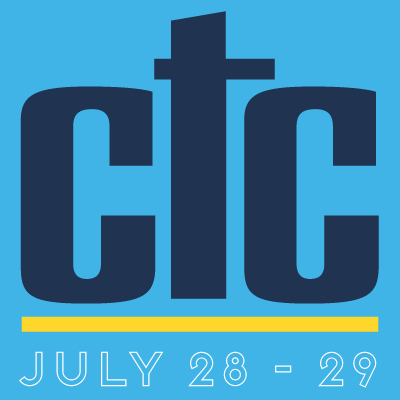 Believe it or not, I’m beginning to feel my age as I prepare my body and psyche my mind for a punishing 100 mile bicycle ride through the hills of Connecticut to raise money for the CT Challenge on Saturday, July 29th. This is my tenth and possibly final year (I’m not getting any younger) to make some serious money in support of cancer survivors. What an amazing event that brings more than 1,000 people (many of whom are cancer survivors) who will be riding along side me. The primary revenue source for the Mission Center for Survivors located in Southport, CT. Please show me the “old man” sympathy vote and support my efforts to benefit cancer survivors by making a donation in any amount that your spirit moves you to make. You can also mail in a check to my business address made out to: CT Challenge. The CT Challenge was started by Jeff Keith who lost a leg to cancer and endured eighteen months of chemotherapy when he was just twelve years old. Jeff was fitted with a prosthetic leg and went onto excel in High school and college sports. Jeff was a very successful businessman, but he felt a strong desire to help others who have survived cancer. He thereafter set a goal of running across the United States to bring attention to the needs of cancer survivors. His passion for achievement and living life to its fullest potential gives cancer survivors true hope that they can also reach for the stars. Many thanks to all who have contributed to this great cause. 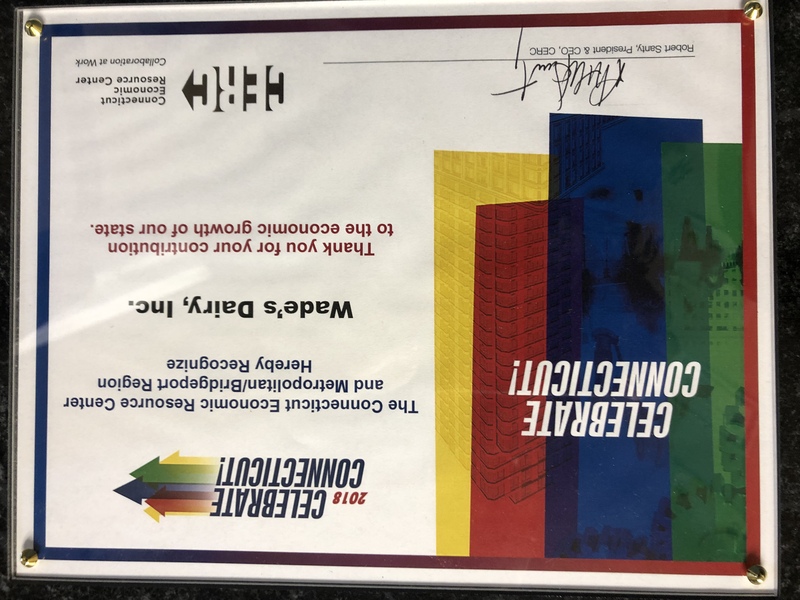 Westfair Communications Inc., publisher of the Westchester County Business Journal, Fairfield County Business Journal and WAG magazine, has recognized Wade’s Dairy as an outstanding family-owned business in the Westchester and Fairfield counties. Our very own Doug Wade was also honored as Keynote speaker of the night. He reviewed the history of our family-owned business and spoke about how we’ve kept it thriving over the years. As many of you know, we spent late 2016 renovating our building to include a brand new warehouse space at our headquarters on Barnum Avenue. 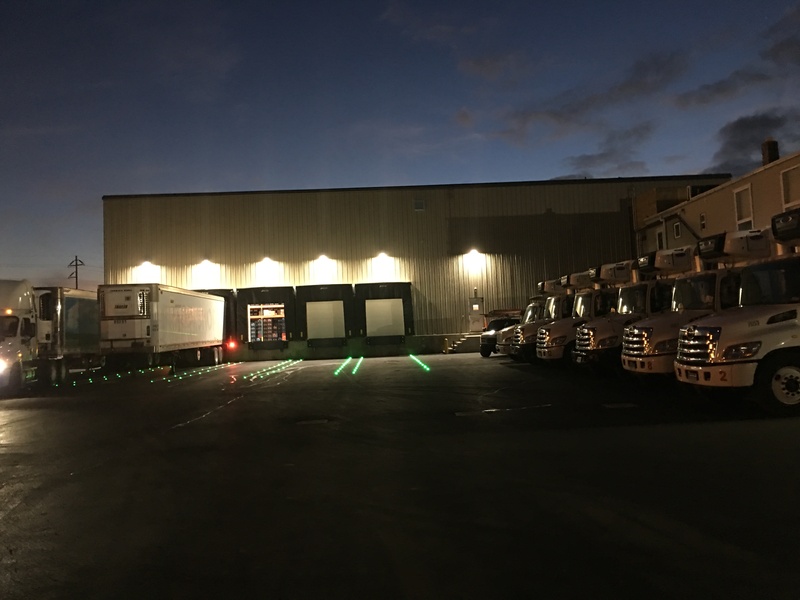 The new 7,000-square-foot warehouse, has refrigerated and frozen sections, which allows our existing office space to link directly to the refrigerated warehouse. As a 123-year-old business, we’re thrilled to continue growing and innovating with the times. A special thank you to Bloomfield-based PDS Engineering and Construction for overseeing our large project. Doug Wade will be participating in his 9th annual Connecticut Challenge (CT Challenge) Bike Ride with Team Milkman. The Connecticut Challenge provides support and assistance to cancer survivors. 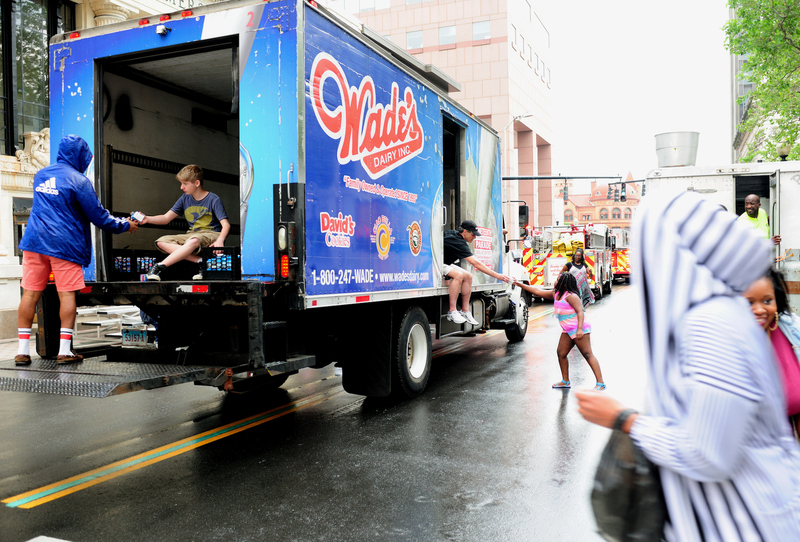 Something exciting happened in 2014 and Wades Dairy Inc. as well as its President Doug Wade are at the heart of it! Watch above as President Obama discusses the raising of minimum wage and Doug Wades impact on the debate! Want to know how all this came to pass? Read on for a short write-up from Doug Wade himself, as to how he got to be intimately involved in discussion and meet the President.